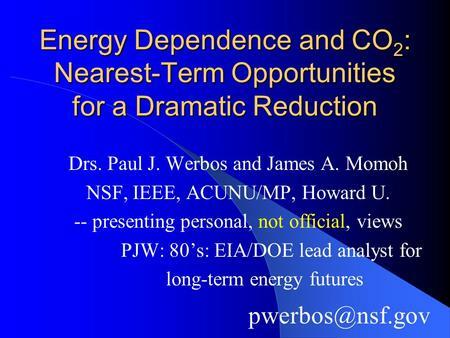 Energy Dependence and CO 2 : Nearest-Term Opportunities for a Dramatic Reduction Drs. 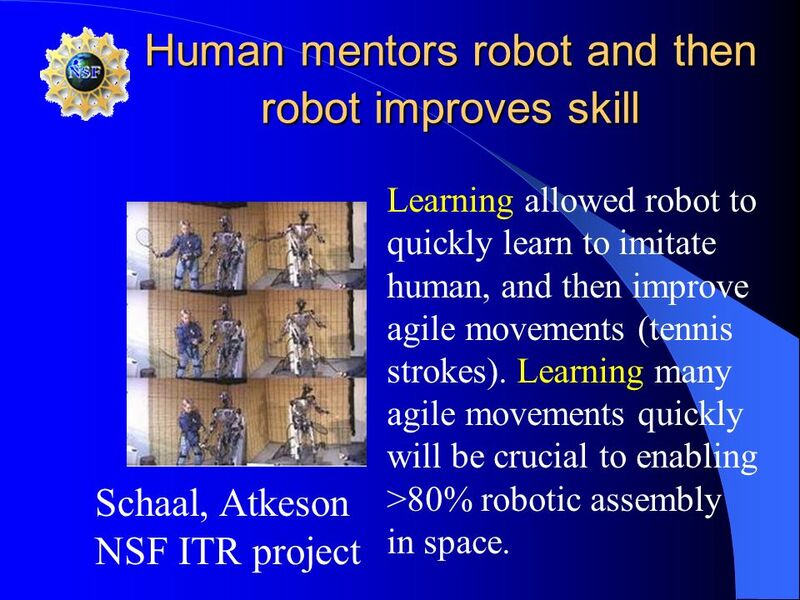 Paul J. Werbos and James A. Momoh NSF, IEEE, ACUNU/MP, Howard U. 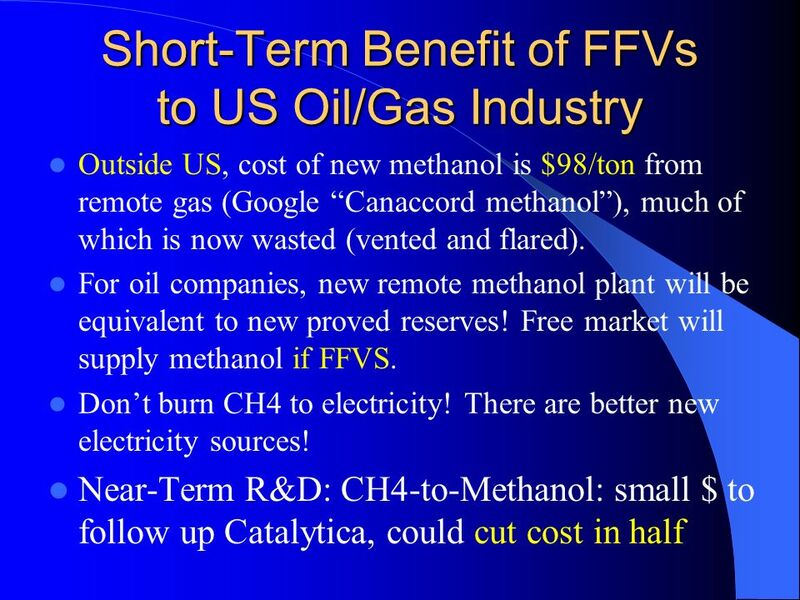 1 Energy Dependence and CO 2 : Nearest-Term Opportunities for a Dramatic Reduction Drs. 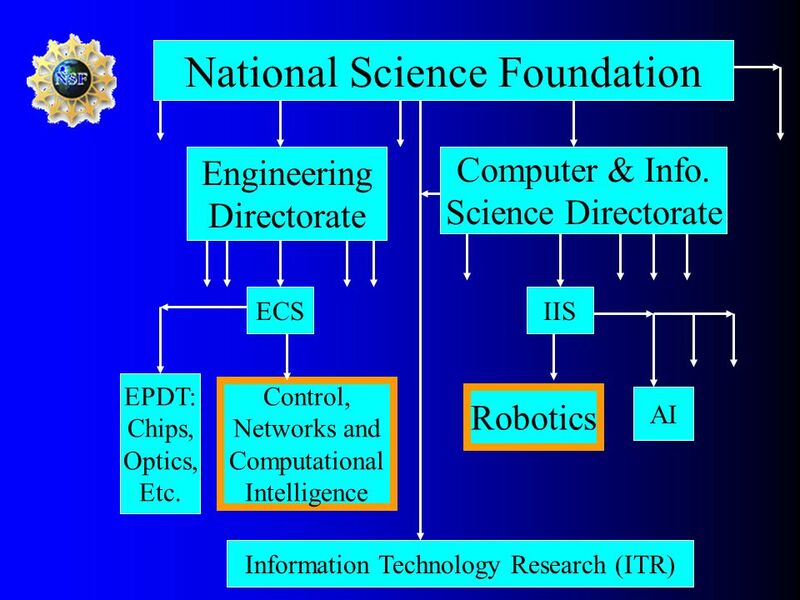 Paul J. Werbos and James A. Momoh NSF, IEEE, ACUNU/MP, Howard U. 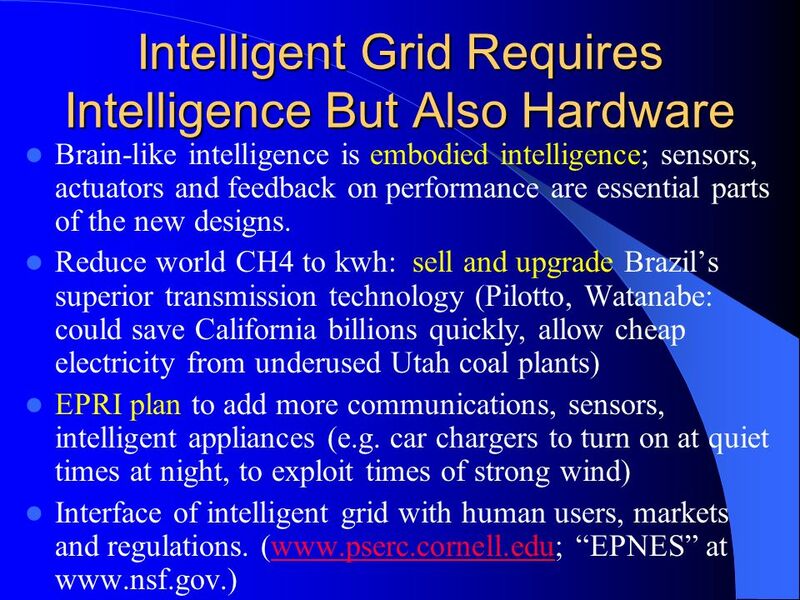 -- presenting personal, not official, views PJW: 80s: EIA/DOE lead analyst for long-term energy futures pwerbos@nsf.gov Government public domain: These slides may be copied, posted, or distributed freely, so long as they are kept together, including this notice. 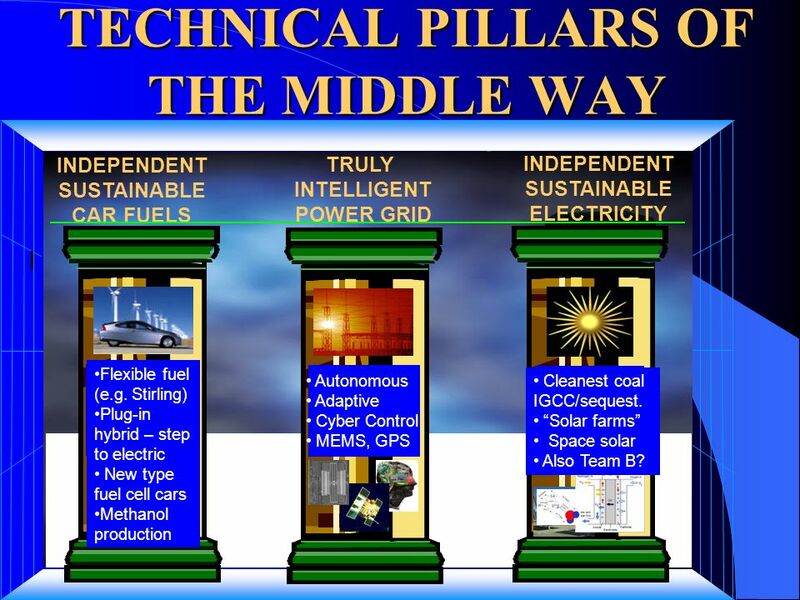 8 TECHNICAL PILLARS OF THE MIDDLE WAY INDEPENDENT SUSTAINABLE CAR FUELS TRULY INTELLIGENT POWER GRID INDEPENDENT SUSTAINABLE ELECTRICITY Flexible fuel (e.g. 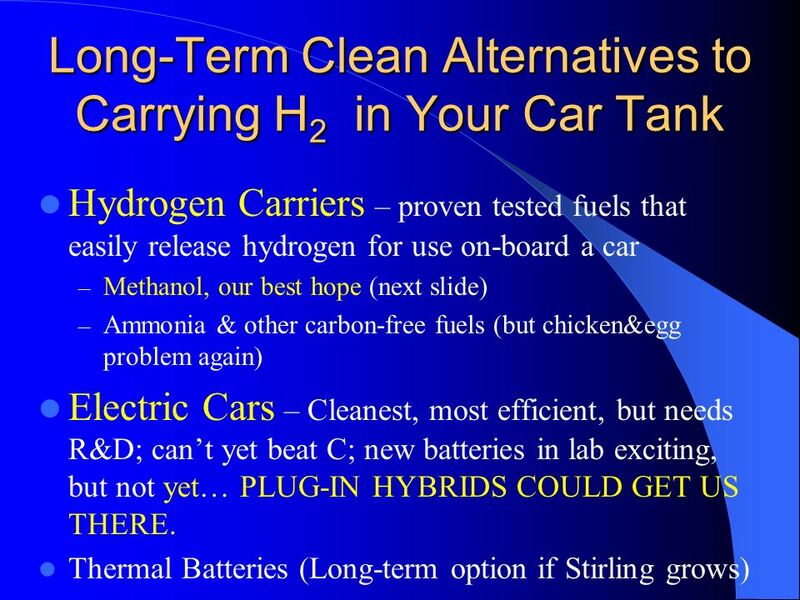 Stirling) Plug-in hybrid – step to electric New type fuel cell cars Methanol production Autonomous Adaptive Cyber Control MEMS, GPS Cleanest coal IGCC/sequest. 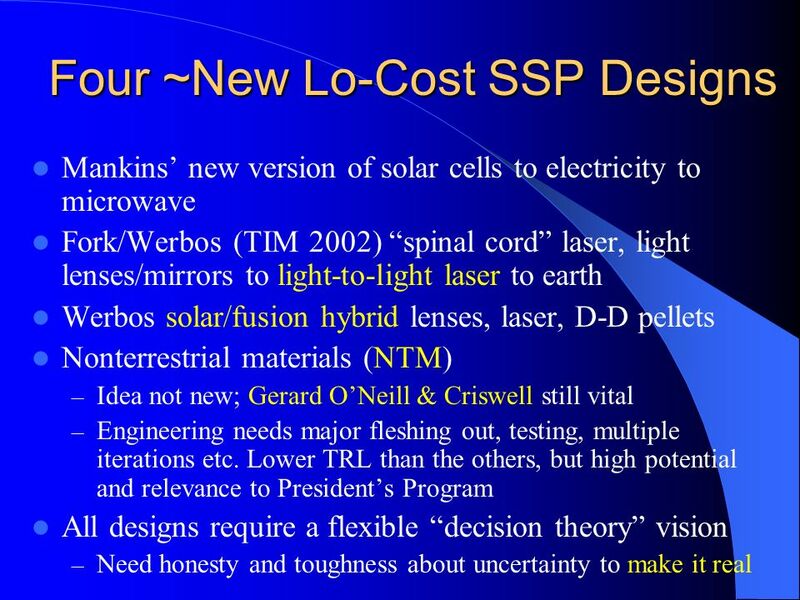 Solar farms Space solar Also Team B? 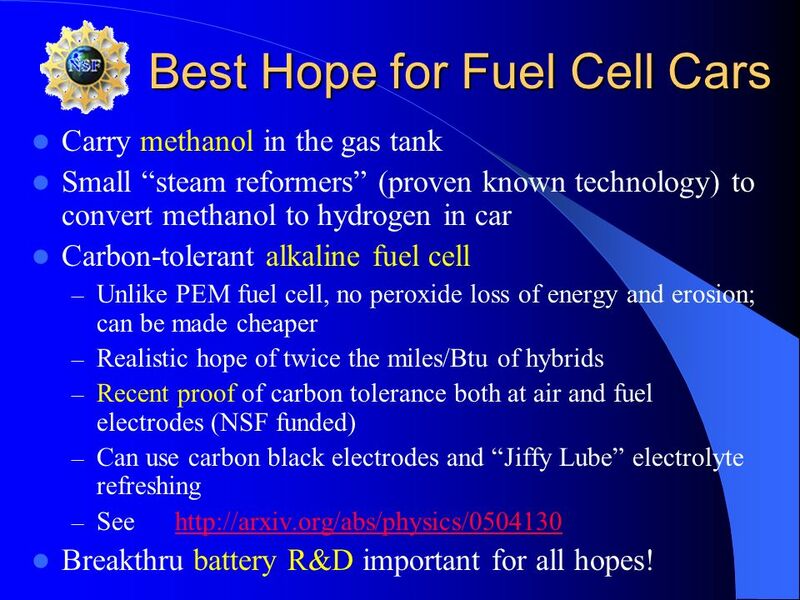 12 Best Hope for Fuel Cell Cars Carry methanol in the gas tank Small steam reformers (proven known technology) to convert methanol to hydrogen in car Carbon-tolerant alkaline fuel cell – Unlike PEM fuel cell, no peroxide loss of energy and erosion; can be made cheaper – Realistic hope of twice the miles/Btu of hybrids – Recent proof of carbon tolerance both at air and fuel electrodes (NSF funded) – Can use carbon black electrodes and Jiffy Lube electrolyte refreshing – See http://arxiv.org/abs/physics/0504130http://arxiv.org/abs/physics/0504130 Breakthru battery R&D important for all hopes! 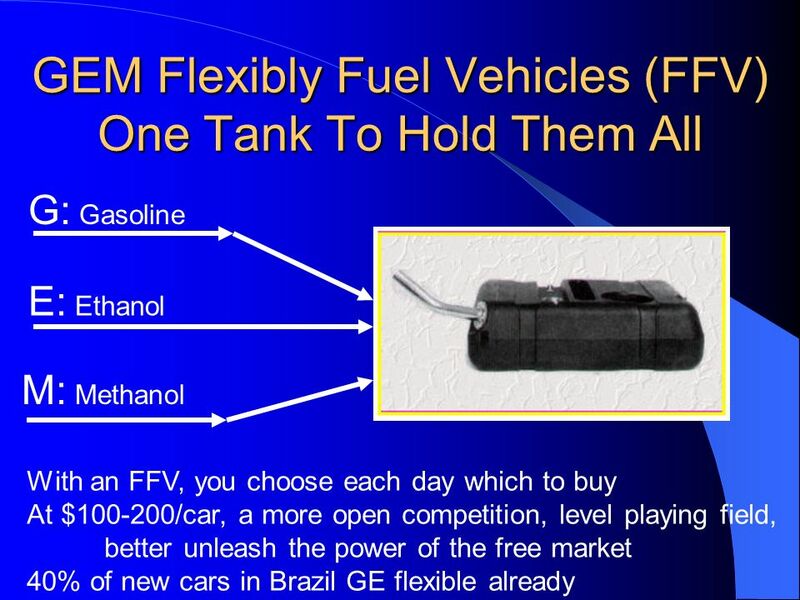 15 Plug-in Hybrids: A Large-Scale Opportunity Here and Now FFV hybrids cut liquid fuel use 50% already. Plug-ins cut 50% of that. 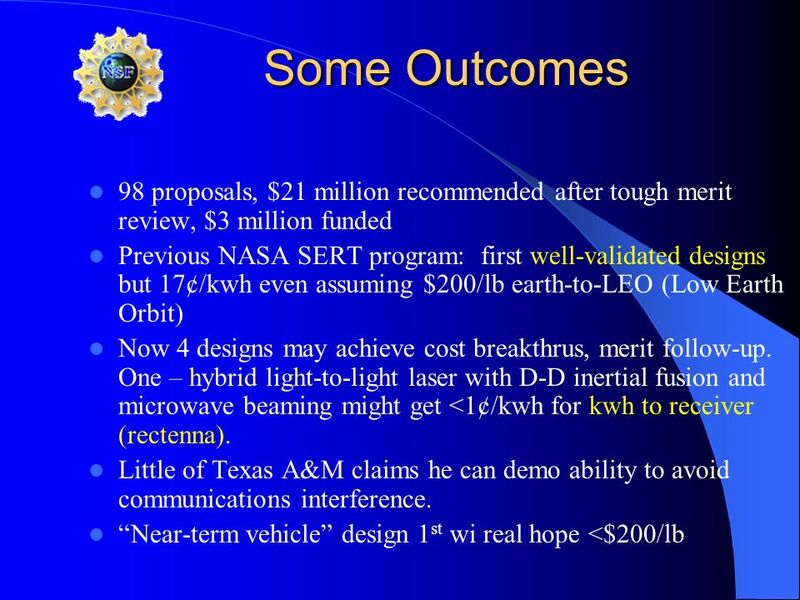 – Researchers have shown that (batteries) offering.. electric range of 32 km will yield… 50% reduction.. (IEEE Spectrum, July/05). Shown in working Prius. Battery breakthroughs in China: from 10/07, 10kwh batteries (larger than) cost $2,000. www.thunder-sky.com. 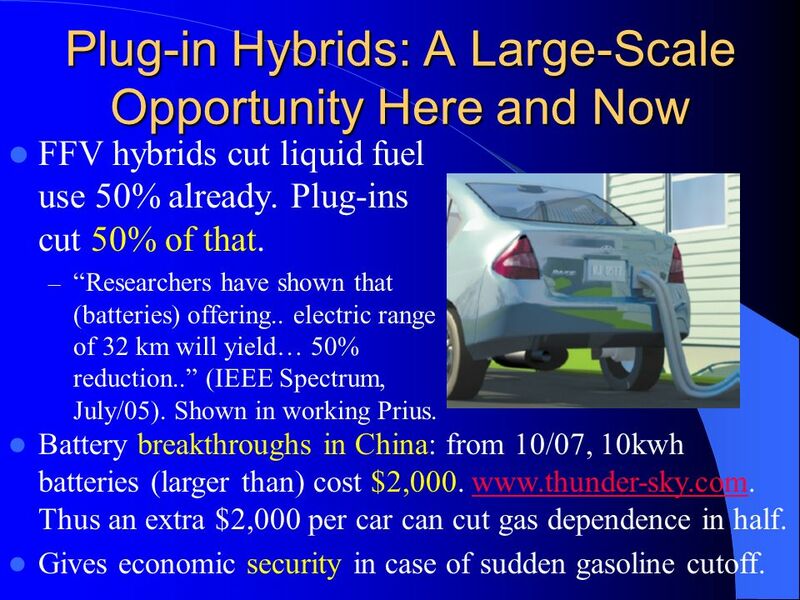 Thus an extra $2,000 per car can cut gas dependence in half.www.thunder-sky.com Gives economic security in case of sudden gasoline cutoff. 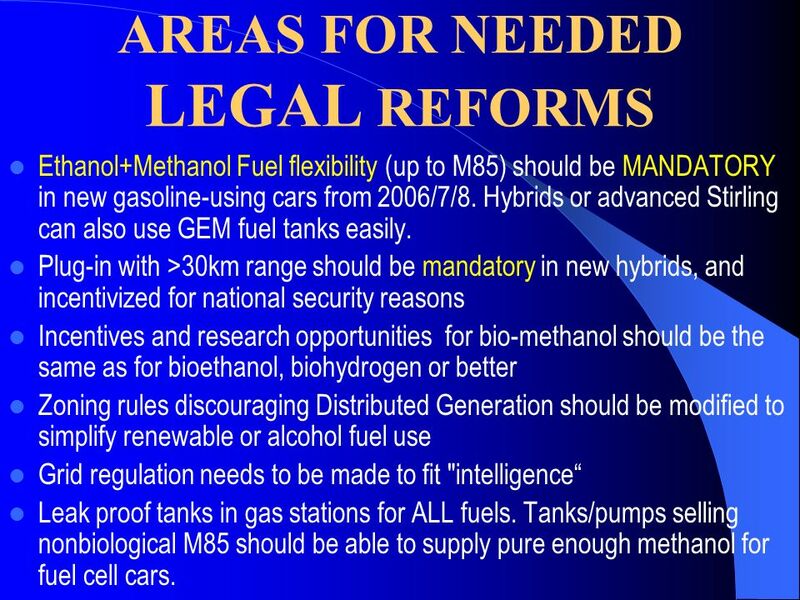 16 AREAS FOR NEEDED LEGAL REFORMS Ethanol+Methanol Fuel flexibility (up to M85) should be MANDATORY in new gasoline-using cars from 2006/7/8. 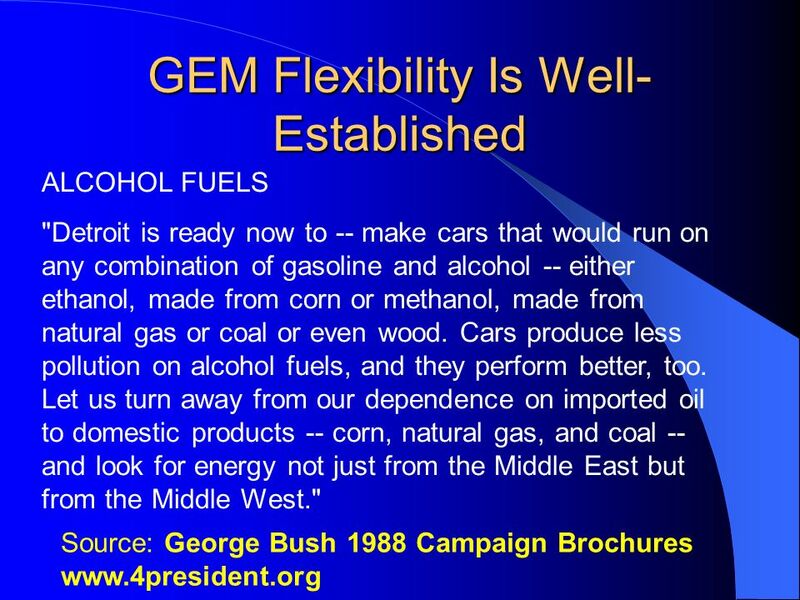 Hybrids or advanced Stirling can also use GEM fuel tanks easily. 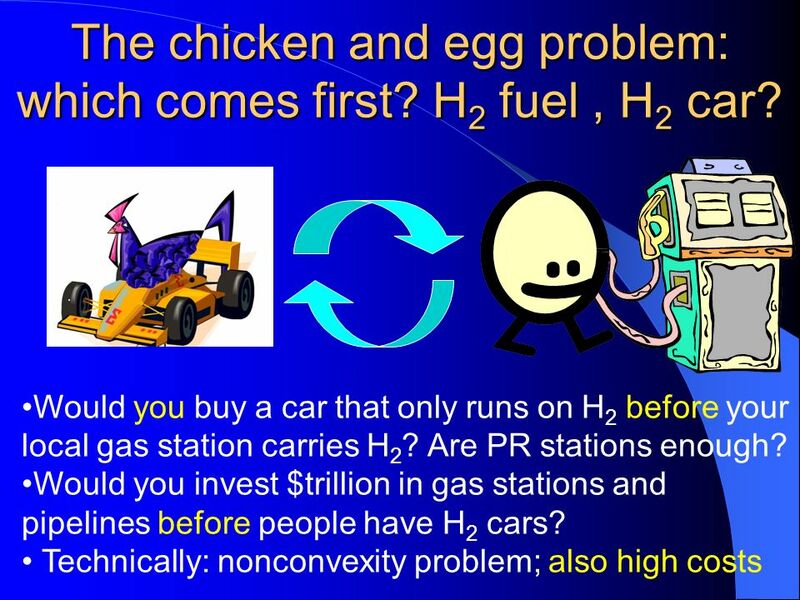 Plug-in with >30km range should be mandatory in new hybrids, and incentivized for national security reasons Incentives and research opportunities for bio-methanol should be the same as for bioethanol, biohydrogen or better Zoning rules discouraging Distributed Generation should be modified to simplify renewable or alcohol fuel use Grid regulation needs to be made to fit "intelligence Leak proof tanks in gas stations for ALL fuels. 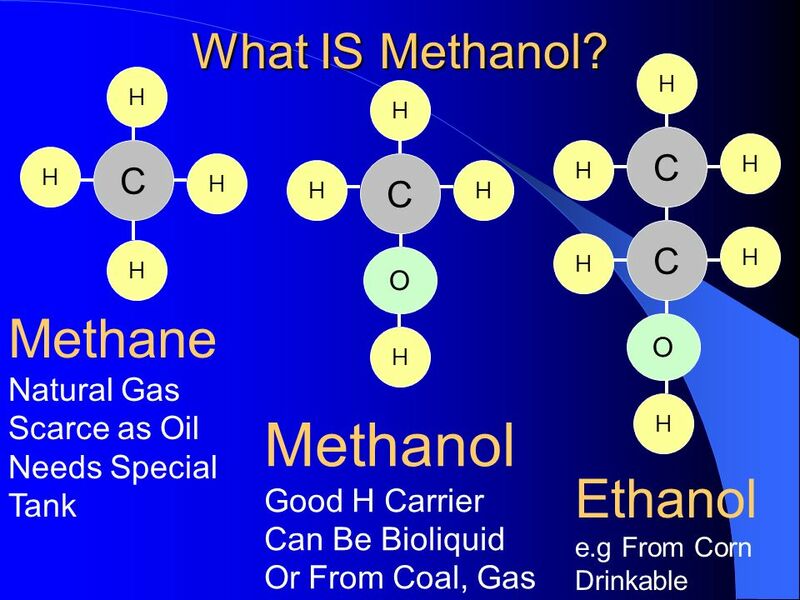 Tanks/pumps selling nonbiological M85 should be able to supply pure enough methanol for fuel cell cars. 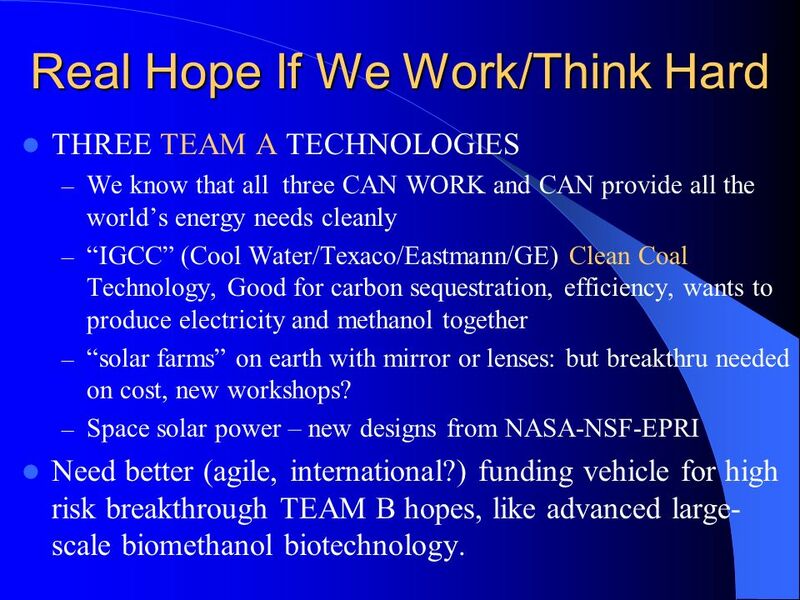 20 Real Hope If We Work/Think Hard THREE TEAM A TECHNOLOGIES – We know that all three CAN WORK and CAN provide all the worlds energy needs cleanly – IGCC (Cool Water/Texaco/Eastmann/GE) Clean Coal Technology, Good for carbon sequestration, efficiency, wants to produce electricity and methanol together – solar farms on earth with mirror or lenses: but breakthru needed on cost, new workshops? 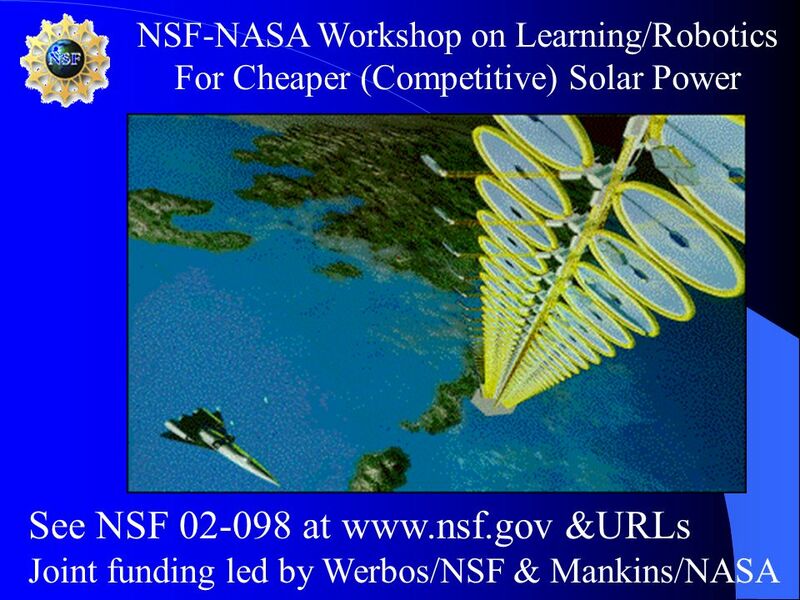 – Space solar power – new designs from NASA-NSF-EPRI Need better (agile, international?) 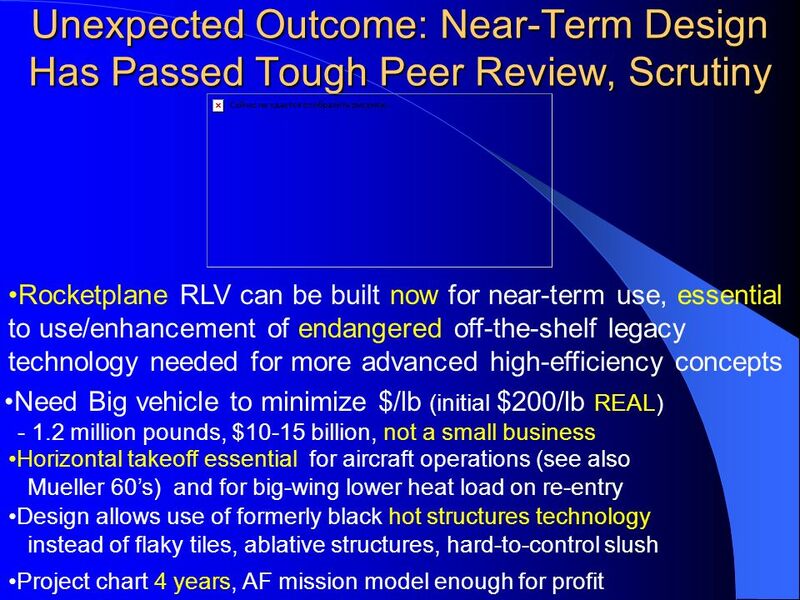 funding vehicle for high risk breakthrough TEAM B hopes, like advanced large- scale biomethanol biotechnology. 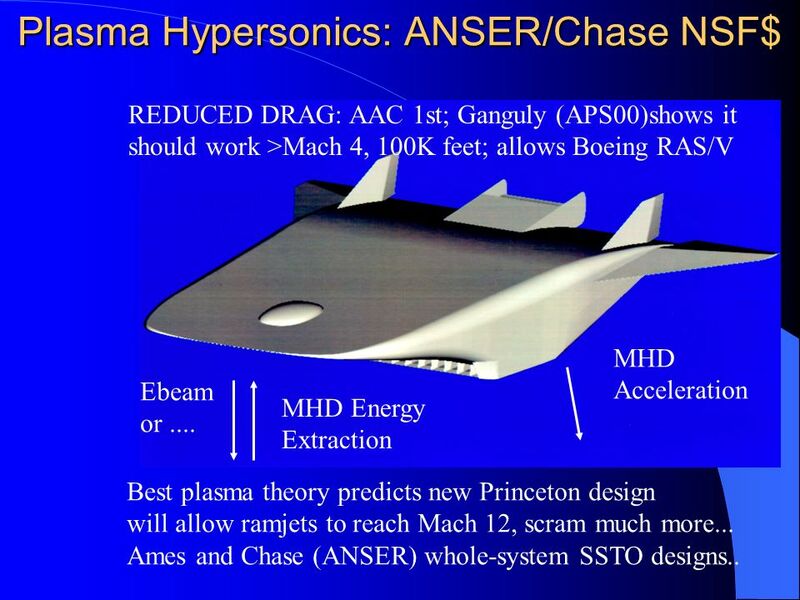 26 Plasma Hypersonics: ANSER/Chase NSF$ REDUCED DRAG: AAC 1st; Ganguly (APS00)shows it should work >Mach 4, 100K feet; allows Boeing RAS/V Ebeam or.... MHD Energy Extraction MHD Acceleration Best plasma theory predicts new Princeton design will allow ramjets to reach Mach 12, scram much more... Ames and Chase (ANSER) whole-system SSTO designs..
29 Distribution and Grids: Upgrading the Middle is As Important As Cars And Sources! 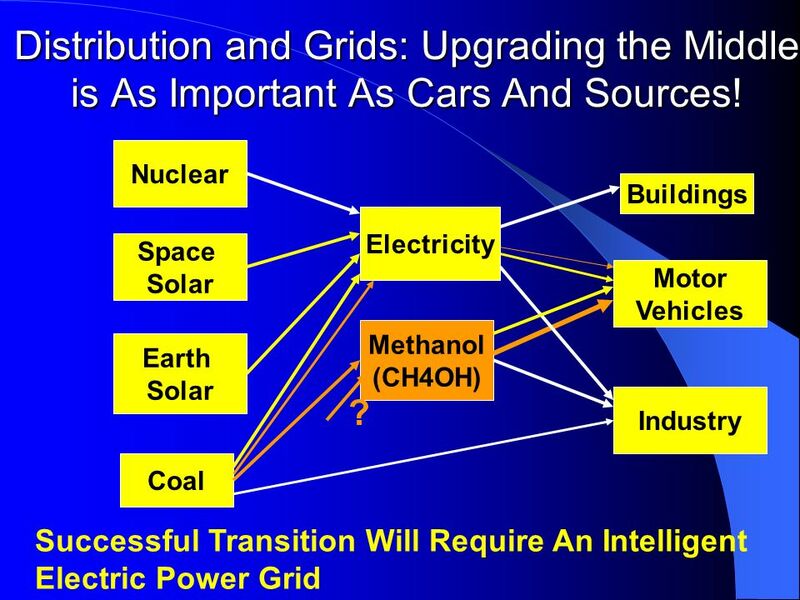 Nuclear Space Solar Earth Solar Coal Electricity Methanol (CH4OH) Motor Vehicles Industry Buildings Successful Transition Will Require An Intelligent Electric Power Grid ? 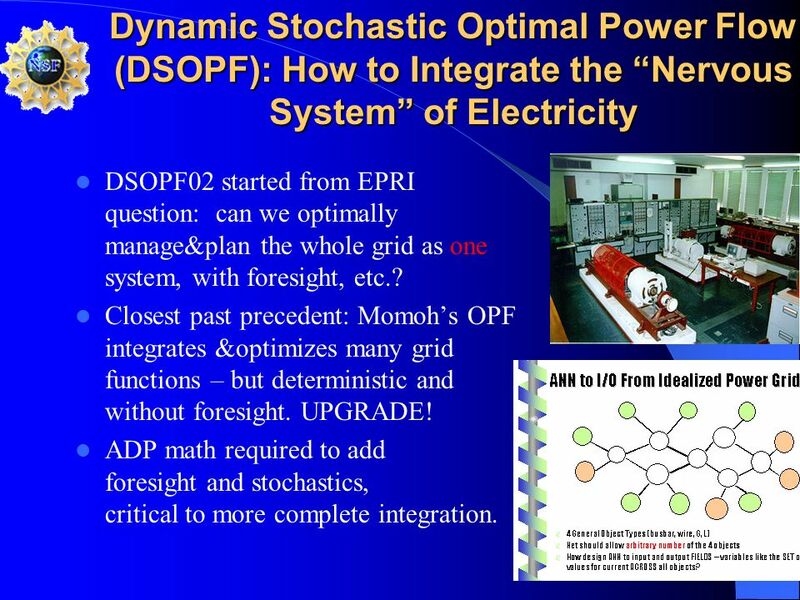 30 Dynamic Stochastic Optimal Power Flow (DSOPF): How to Integrate the Nervous System of Electricity DSOPF02 started from EPRI question: can we optimally manage&plan the whole grid as one system, with foresight, etc.? 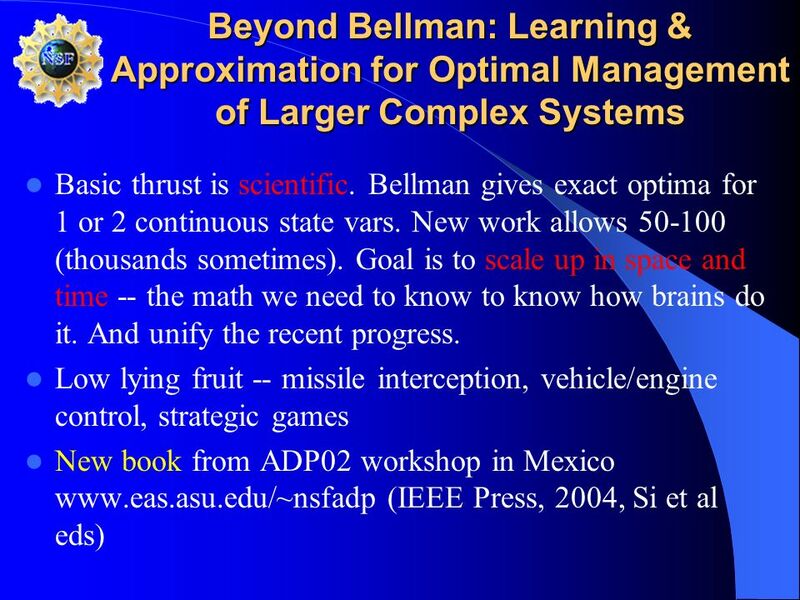 Closest past precedent: Momohs OPF integrates &optimizes many grid functions – but deterministic and without foresight. UPGRADE! ADP math required to add foresight and stochastics, critical to more complete integration. 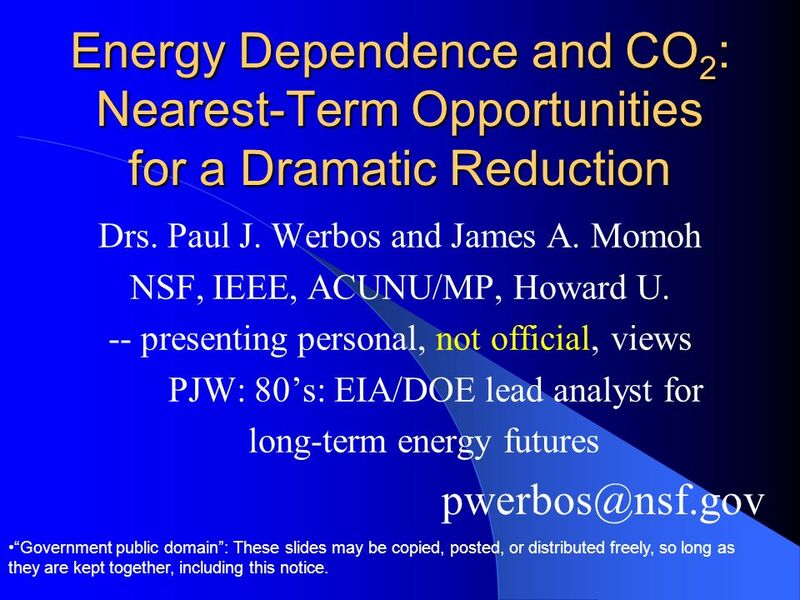 Download ppt "Energy Dependence and CO 2 : Nearest-Term Opportunities for a Dramatic Reduction Drs. 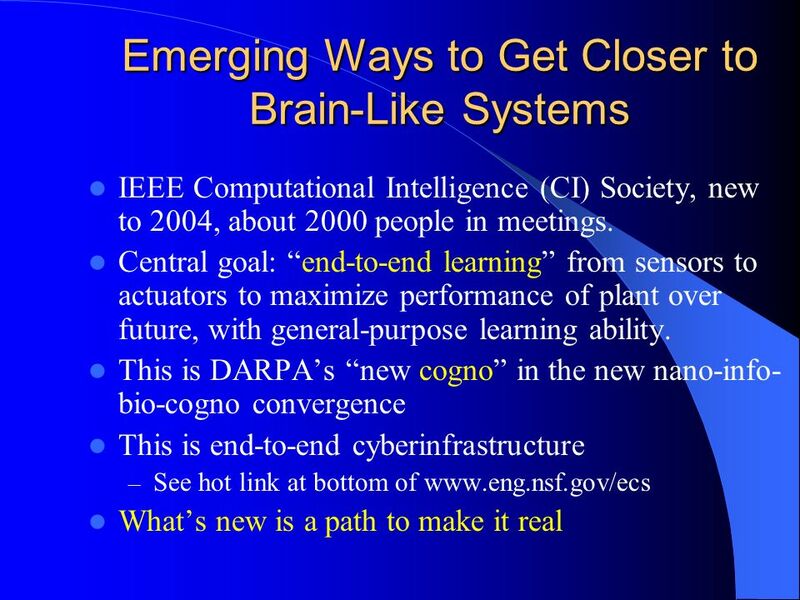 Paul J. Werbos and James A. Momoh NSF, IEEE, ACUNU/MP, Howard U." Sections Going Green IEEE-USA Meeting – Indianapolis Central Indiana Section Earl Hill & Will Kassebaum. 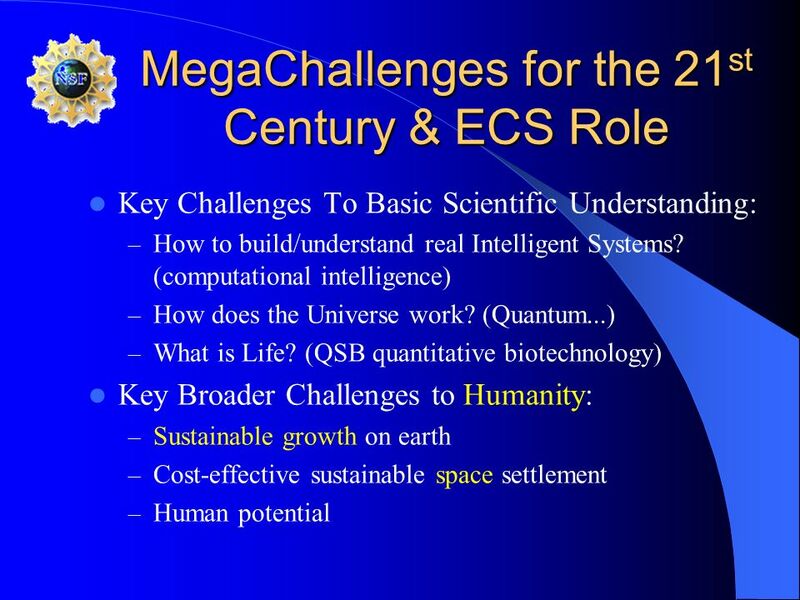 The Changing Energy Landscape Economic Competitiveness Energy Security Environment / Climate Change New Opportunities. Electric cars: part of the problem or a solution for future grids? 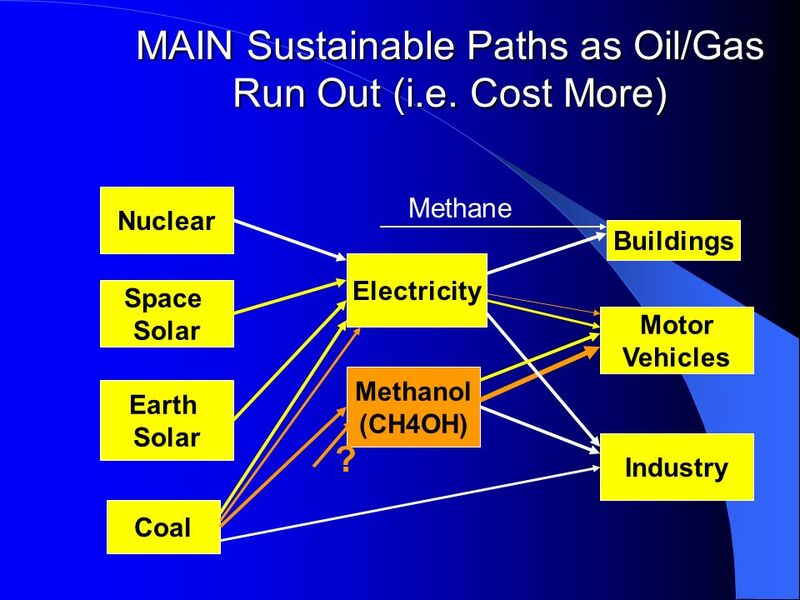 Frans Nieuwenhout, Energy research Centre of the Netherlands ECN Sustainable. The Institute for the Analysis of Global Security (IAGS) is a Washington based non-profit public educational organization dedicated to research and public. Set America Free 101 Institute for the Analysis of Global Security Anne Korin. Israels role in turning oil into salt Gal Luft, Institute for the Analysis of Global Security. LNG – Science and Technology in use for Energy Development in Qatar Presented to Qatar Academy 10 March 2009 James Baldwin Head of Environmental Affairs. 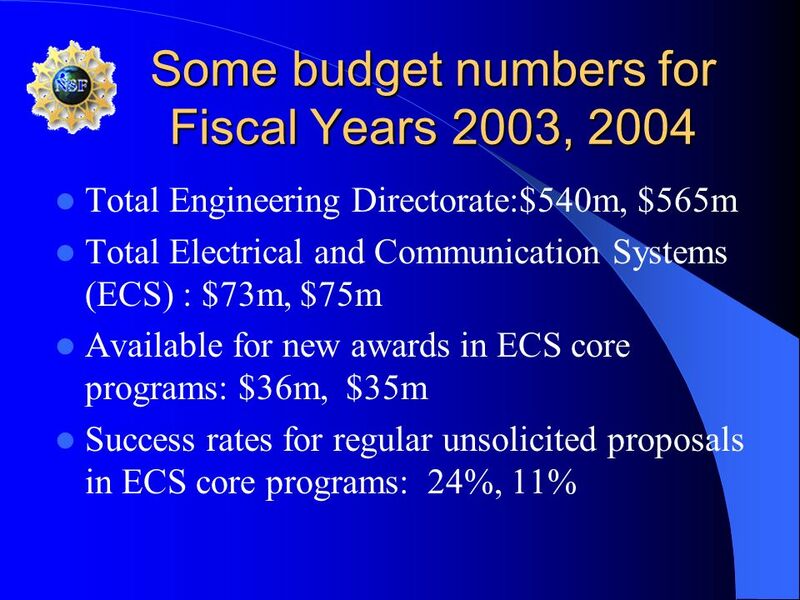 A Lower-Cost Option for Substantial CO 2 Emission Reductions Ron Edelstein Gas Technology Institute NARUC Meeting Washington DC February 2008. 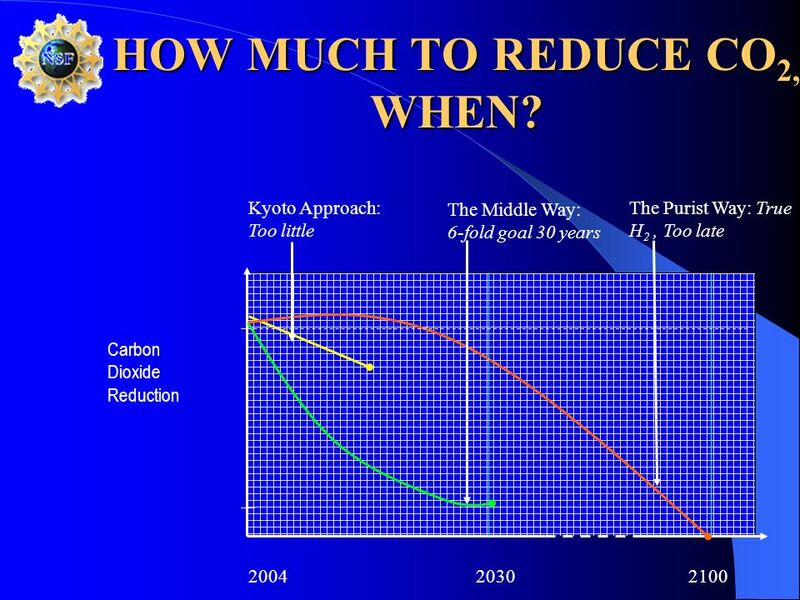 CHANGES IN ELECTRIC GENERATION Generation vs. Demand: Demand growing 3% per year New Generation more difficult to build. 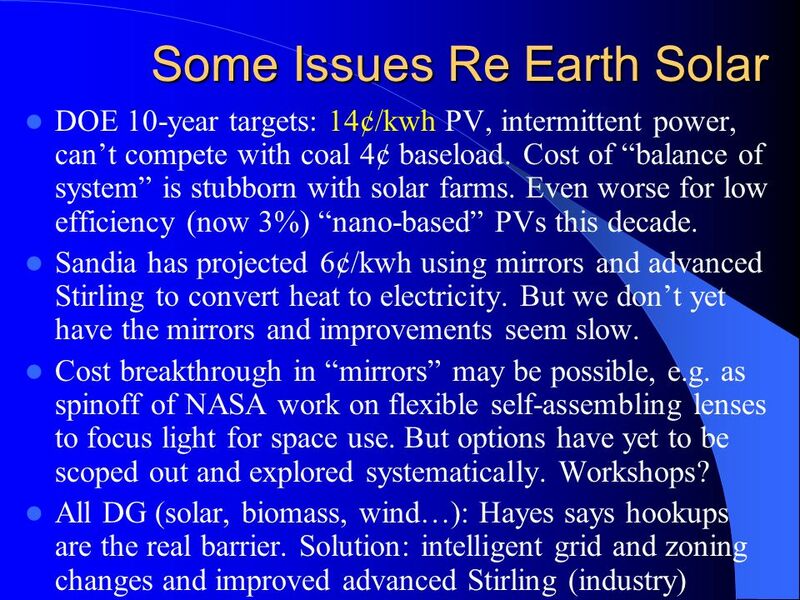 Energy Efficiency and Renewable Energy G. Tyler Miller’s Living in the Environment 14 th Edition Chapter 18 G. Tyler Miller’s Living in the Environment. 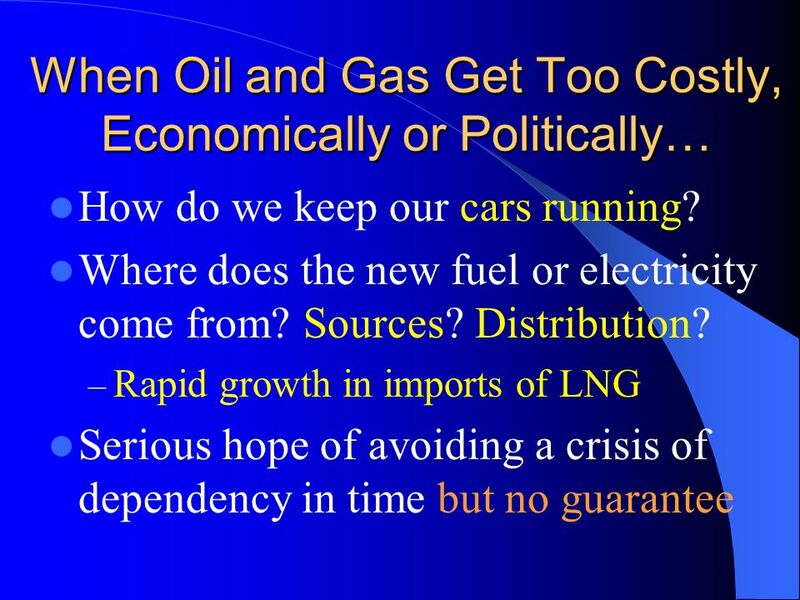 The 40 th Anniversary of the Oil Embargo – Looking Ahead 100 Days Transportation Fuels and Energy: All of the Above in Cranking Up All Vehicular, Air and. Energy is the ability to do work (move a mass in the direction of force) or to cause a change. Wind has energy to move these wind turbines. 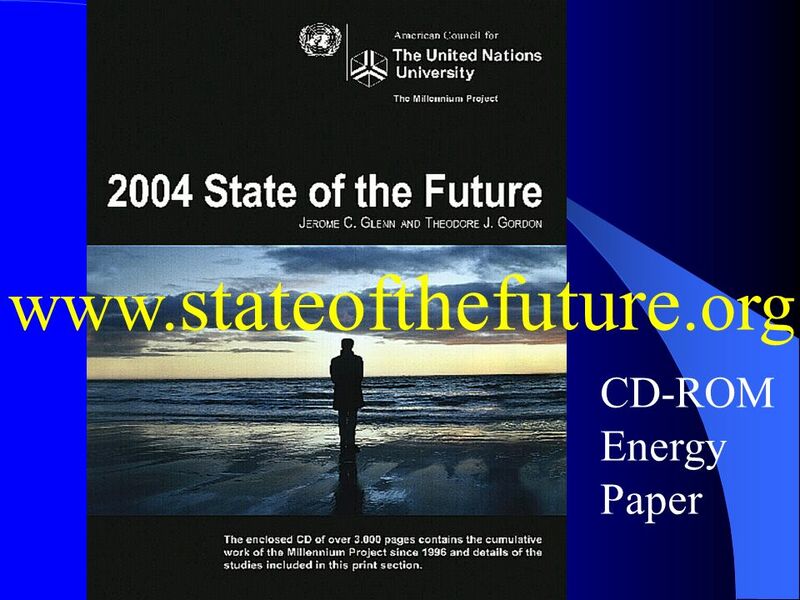 Chapter 5: Energy Resources Section 2, Renewable Sources of Energy.